This is my second time reading this wonderful masterpiece and once again I was captured right from the start. Sarah's world building is on point, I am always left with a clear image in my mind... and boy do I wish I lived in this world haha. One character in particular that I love is Lucien, he is down right hilarious and I found myself constantly laughing. I think that's something super important in a book, it can make you laugh but not just in your head but out loud. This book is the kind that you want to read in one sitting. ACOTAR has a bit of everything, its got action, romance, suspense, mystery. What more do you need? If I had to say anything bad about this book it would be that in certain scenes Feyre would talk about Tamlin and how "gorgeous" he is and his muscles. It just got a bit excessive and yeah I get he's attractive he's high fae but learn when to stop haha. 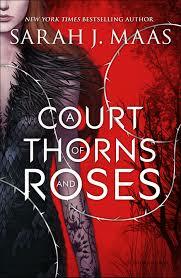 This is a book that I highly recommend, I actually enjoyed it a lot more that throne of glass dare I say. Even if your not that big into fantasy and love romance, pick this up because once you start reading you wont be able to stop and let me tell you. A Court Of Mist And Fury is even more phenomenal.